A few years ago, a friend and I were musing over building our own windmill. Eventually we concentrated on the Savonius rotor turbine. We decided to build one so we rounded up four empty 44 gallon (200 litre) drums and cut them all in half lengthwise. This gave us eight halves, which to the casual observer must have looked like eight home-made barbeques being constructed. We needed to make the frame and an advertisement for cheap steel found us picking up some 40mm and 50mm tubing (exhaust pipe material). We constructed a tower using the 50mm pipe for the uprights, with the 40mm pipe used for bracing. The finished tower was a little over six metres in height. The next stage was to assemble the rotor. The half-drums were welded to a solid 50mm length of steel for the shaft. We attached two sets of four drums for extra power, as can be seen in the photos. We still have space for another set of drums, but believe we do not need it for the moment. Self-centering bearings were used to locate the finished rotor to the cross bracing on the tower. Flat strap (about 20mm wide) was used to join the drums top and bottom for strength and stability to prevent them twisting in high winds. I had a lot of fun working out the pulleys. The rotor spins vertically and I had to convert this motion to a horizontal axle to drive the pump. I fixed this by simply twisting one of the belts through 90 degrees and as they were long enough,this was not a problem. The rotor is connected to the axle via a dog clutch which is operated by a lever. In high winds the windmill still spins but you can disengage the clutch to protect the pump. 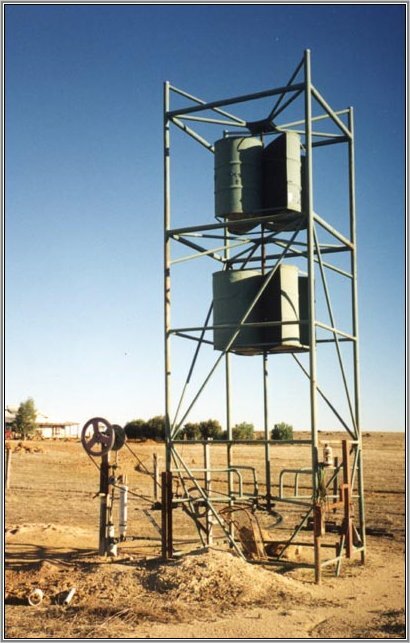 The bore pump is a ball-type poly pump. We used a ball joint from an old Ford Falcon attached to a metal disc (off center to give it a cranking motion) to drive the pump. The disc is attached to one end of a shaft which is driven by an 18 inch diameter pulley at the other end. This pulley is driven via a second belt from the dog clutch shaft. This arrangement is mounted on 50 x 100mm RHS (metal tubing). This setup can seen in the photos. This machine was a lot of fun. I never tire at watching it work and it is a great conversation piece. It has also become a bit of a landmark in our area and as a result our property is called 'Humdrum Towers. 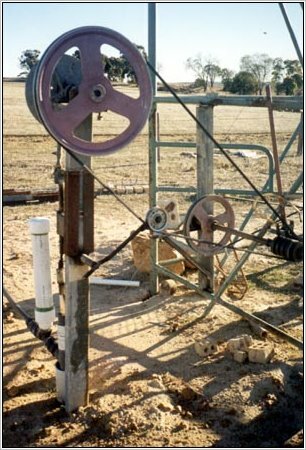 Closeup of the pulley and poly pump. The whole arrangement is quite simple and uses off-the-shelf bits.